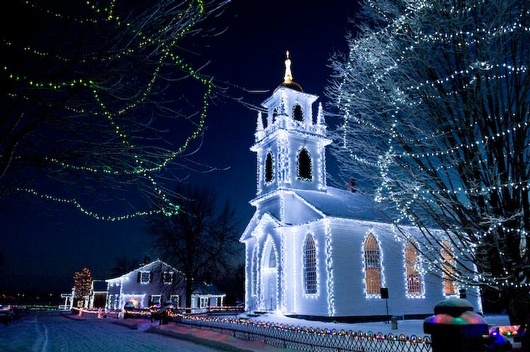 Cornwall, ON – November 25, 2014 – The Christmas Spirit is alive and well across Cornwall and the Counties, and nothing shows it off better than our absolutely stunning displays of Christmas lights at two renowned festivals: Upper Canada Village’s Alight at Night and Alexandria’s Festival of Lights. Each festival runs throughout the month of December, giving families ample time to plan their trip around weather conditions and, of course, the busy holiday season. 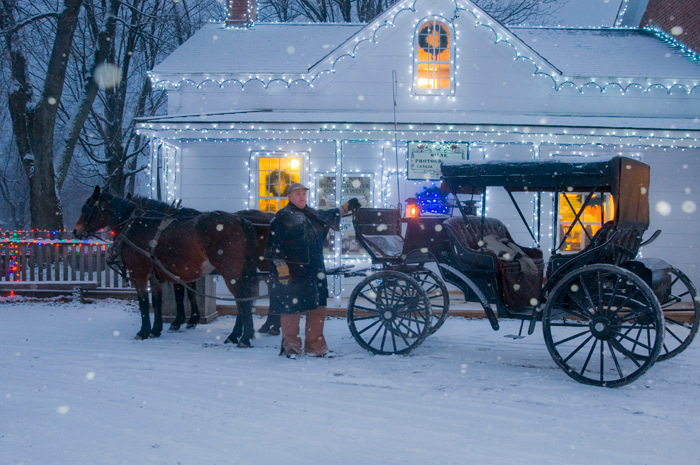 The historical Upper Canada Village provides a beautiful backdrop for the Alight at Night celebration, as nearly one million lights adorn the trees, pathways, fences and buildings throughout the village. Take a stroll through the enchanted village, or give your feet a rest and hop aboard the horse-drawn wagon for a truly magical experience. Also available (and recommended) is the Toy Train ride through the beautiful Crysler Park. With Christmas lights strewed across this cool toy train, you may actually feel like you are in Santa’s Village! One of the new additions to this great holiday festival is a 50ft Ferris Wheel that will give you a bird’s eye view of the entire village. The beautiful display is unbelievable from the ground, and will be sight to behold from high above the historic village. The wagon, train and Ferris Wheel rides are included in your admission and available to all visitors, but there are options for a more intimate evening at Alight at Night. You can cuddle up close to your significant other for a romantic horse-drawn carriage ride for two through the village’s stunning displays, and also includes a gourmet gift of freshly made Village bread and cheeses, as well as a 20% off voucher for Pommier Jewelers of Cornwall. These beautiful private tours are sure to make for an enchanting, romantic evening. Reservations are required and can be made by calling 1-800-437-2233; book early as these popular rides get snatched up quickly! The Alexandria Festival of Lights is entering its 9th season, and like Alight at Night, has a beautiful backdrop that brings out the gorgeous lighting display. Along the waterfront of Island Park in the heart of the town of Alexandria you will find over 200,000 lights adorning the trees, fences, grandstand and elaborate displays all across the park. The Alexandria Festival of Lights is a FREE event for all visitors, making it a great evening for the family to enjoy quality time and get into the Christmas spirit together. Open every evening, 5 p.m. – 10 p.m., from November 29 – December 31, the Alexandria Festival of Lights also incorporates some fun events throughout the month to coincide with the festival. The grand opening on Saturday, November 29 features a great evening of live entertainment and a BBQ, The Santa Clause Parade makes its way through Alexandria on November 30, and on December 31 the skies above Alexandria will light up like the park as the closing ceremonies take place which feature an extravagant fireworks display for New Year’s Eve. Check out the website for a full list of excitement happening throughout Island Park during Alexandria’s Festival of Lights. Festivals like Alight at Night and The Alexandria Festival of Lights are great ways to celebrate the holidays with the family, and the beauty of month-long events like these is that you don’t have to make a difficult choice on which to see. Take a look at each event’s websites and decide which nights work best for you, and you can incorporate both events into your busy holiday schedule. Trust me, you won’t be disappointed you did!